*Pierre does not link to such grotesquerie as Leonard Weaver’s AHH! 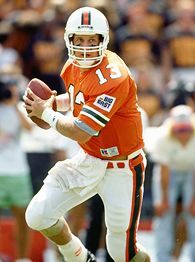 CORAL GABLES — 1992 Heisman Trophy winner Gino Torretta held a surprise press conference on Wednesday in Coral Gables to announce that he would follow Reggie Bush’s lead in forfeiting his Heisman Trophy. Torretta then cited his 1992 statistics from a sheet of paper, seemingly expressing incredulity that anyone of his low caliber could win college football’s most prestigious award.